Real taste of sweet potato is preserved in this rustic and natural tasting Sweet potato Yokan. An old style “steamed potato confection” made only with Japanese sweet potato, sugar and Moshio salt. Traditional Japanese sweets that let us enjoy the natural taste and the aroma of the sweet potatoes and make the people of Japan reminiscent of the good old days. 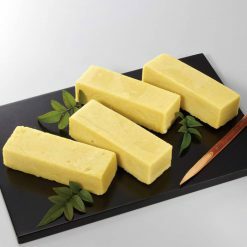 Sugarlady’s Sweet potato Yokan uses Moshio, a type of sea salt that was made with an old method of making salt using seaweed. Moshio is a mild-flavored salt with less sodium compared to other salts, and has a variety of nutrients such as iodine which works as a hormone and promotes growth and metabolism, and fights against bacteria. Moshio is also a great source of various minerals including calcium, potassium and magnesium. Japanese sweet potatoes provide us with Vitamin E, Vitamin B6, folic acid, pantothenic acid, potassium, copper, and molybdenum. 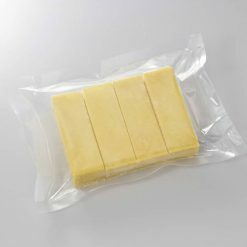 Specifically the Beni Azuma sweet pototes used in Sugarlady’s sweet potato Yokan are grown mostly in Kanto region and are sweeter than other sweet potato brands grown in Japan. Thaw at room temperature for 2 to 3 hours. It can be served and enjoyed right ater thawing. It can be toasted in the toaster oven for 8 to 10 minutes for a baked potato Yokan with toasty flavor.Heating times are approximate. Please adjust depending on the quantify and the model specifications. Heated product can be hot. Please take caution. This product contains sweet potato (Beni Azuma / domestic), granulated sugar, salt (Moshio). Origin of ingredients: sweet potato (domestic). Prepared and packaged in Japan.